Menopause symptoms affect more than half of menopausal women throughout their transition. During menopause, a woman's levels of estrogen, progesterone, and testosterone fluctuate and then drastically decline. This decline typically causes a number of symptoms, including vaginal dryness, hot flashes, night sweats, and mood swings. Herbal remedies are an alternative to prescription drugs and over the counter pain medication. 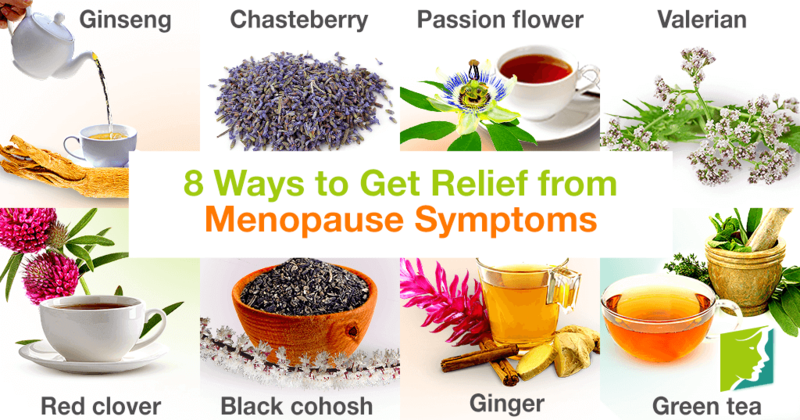 There are several herbal teas that can help alleviate menopausal symptoms caused by hormonal imbalances. These herbal teas are available at most grocery stores or natural food stores. Ginseng is widely used for its many therapeutic benefits, like improving concentration and increasing energy levels. It has also been known to help manage hot flashes, night sweats, vaginal dryness, and encourage hair growth. Chasteberry, also known as Vitex or agnus-castus, was traditionally used for treating premenstrual symptoms, and is used today to help alleviate menopausal symptoms. Chasteberry can help reduce breast pain and soreness. Passion flower is a plant that has been used to treat sleep disorders, night sweats, anxiety, and gastrointestinal disorders. It has a relaxant effect because it increases levels of the neurotransmitter gamma-aminobutyric acid, which induces tranquility. Valerian is a popular herb for menopausal women because it can help fight depression and mood swings. Valerian has traditionally been used as a natural treatment for insomnia, depression, and anxiety because of its sedative characteristics. Red clover is high in phytoestrogens, which are estrogens produced by plants. These help restore estrogen levels back to normal, and can also help with menopausal symptoms like night sweats and hot flashes. Black cohosh also contains estrogenic compounds and introduces these plant-based estrogens into the body in order to help restore balance by increasing estrogen levels. Black cohosh has been used to treat vaginal dryness and hot flashes. Ginger is rich in antioxidants and other nutrients, and it is also anti-inflammatory. It is a popular herb because of its varied medicinal qualities, including relief from nausea and gastrointestinal discomfort, helping to relieve menopausal bloating. Green tea is soothing and stimulant. It has been shown to relieve fatigue and support weight loss, making it popular among menopausal women. Menopausal symptoms can be frustrating and sometimes even debilitating. Herbal remedies are a natural way to help manage bothersome symptoms like hot flashes, vaginal dryness, and mood swings. Herbs like black cohosh and red clover are high in phytoestrogens, or plant-based estrogens, and can help naturally restore hormone balance. Valerian and passion flower are sedative and soothing and can be used to help with insomnia, depression, and anxiety. Most of the featured herbs are widely available at grocery stores and natural food stores. menopause is a stage of life that occurs in a woman's 40s to 50s. Read on to see if your mom is going through menopause.